Cinedelphia recently spoke with Philly native Rel Dowdell, writer/director of the new dramatic thriller Changing the Game. CINEDELPHIA: So this is your second feature film, was your first one [Train Ride] set in Philly as well? REL DOWDELL: Well, I shot it at Cheyney University, used the whole school; saved money, saved time. It was a fictional college, I gave it a fictional name. C: Changing the Game is set in Philly proper. RD: Yes, I wanted the character to come from a rugged, impoverished background. When I was growing up, one of the notorious areas that I heard everybody talking about, almost with an urban legend status, was 8th and Butler, North Philadelphia. So I wanted to base the character around a very fierce neighborhood to show that this young gentleman can come out of that tumultuous environment and do well, succeed. A lot of times with African American films, it’s not an experience that everyone can relate to. Anybody can relate to this type of story, anyone can rise from their background and succeed. It’s a human story, not an African American story. Overcoming struggle, overcoming adversity, succeeding. C: That’s a unique approach as African American filmmakers tend to tailor their work to a particular audience. RD: Yeah, it’s 2012 and I think the world is more universal. My main character starts off in North Philadelphia, he goes to Wharton, different kind of people there. Then he goes to Wall Street, different kind of people there. Then he does overseas trading and investment banking over in London and Thailand, he interacts with all kinds of people, it’s multicultural. It’s called Changing the Game for more than one reason. This young man realizes that the North Philadelphia world and the Wall Street world have similarities as far as overcoming things. North Philadelphia you have to be more physical to survive, Wall Street more mental. You have to have street sense for North Philadelphia, maybe common sense for Wall Street. So I didn’t want to pigeonhole the film as an African American film. C: So you set out to create an accessible human drama. RD: That’s the goal, the real goal of the whole thing. And I think the more diverse your cast and storyline are, the more relatable it can be. C: So when creating this arc for the character that spans professions and locations, where did you pull that from? RD: People that I knew, a friend of mine named Aaron Astillero knew a lot about Wall Street as far as vernacular. Filmmaking is a collaborative process, it’s not a one-man show, so you need to be able to ask for help when entering certain areas. C: As far as filmmaking goes, did you take any lessons away from your first film? RD: Not necessarily. I did know one thing, I couldn’t make Changing the Game as a first feature, it’s too ambitious, it covers too much ground. Having that first feature under my belt definitely prepared me for the second. When you’re making an independent film and under budget constraints, essentially I’m trying to make an epic film for a small amount of money so when your margin for error is that miniscule you’ve gotta cut your teeth on something. C: How about as far as distribution goes? RD: Years ago you would put all your eggs in a basket and go to Sundance or Toronto and have all these companies see your movie to get distribution, but it’s changed now because a lot of those companies that were doing well back then, Gramercy, New Line, Paramount, Warner Independent, those companies are gone now. So going to those festivals now is different than it was. We’re not getting the same type of attention, a lot of people are going to those high profile festivals and still not getting distribution. You might leave with a DVD deal, but the real goal of an independent filmmaker is to hopefully get theatrical distribution. What I did was, instead of worrying about going to all these other festivals, I hit one festival really hard, the Hollywood Black Film Festival, and my strategy was to go to that screening, pack that screening, and do like Paranormal Activity and Final Destination and tape the reactions of that crowd coming out. All types of people. Whoever came out of that theater, I got their reaction. And then I sent it to AMC, AMC has a division called AMC Independent that puts independent films into AMC theaters around the country. You’ve gotta be more strategic now if you want theatrical. C: Do you think filmmakers these days are less concerned with getting that theatrical release? RD: It’s hard because these days where do you go? You have to have some more capital behind you, you have to be creative. C: There must have been some money involved for the production itself since you have some established actors in it? RD: Tony Todd saw my first film and said “this is great, it’s got vision, it reminds me of something Kubrick would have done, whatever you do next keep me involved.” So once I had his commitment, other actors followed suit. That’s the way to do independent film, try to get a veteran actor, someone of note, and then hopefully others will follow suit. So after Tony Todd, Irma P. Hall, Sticky Fingaz, you gotta be real creative with that. C: Any other advice for aspiring filmmakers? RD: Make the best possible film for what you have. The economy has changed, the film distribution landscape has changed, so the filmmaker has to change too, has to adapt. And you have to be creative to do it, you have to tap all your resources to do it. The best advice I can give any filmmaker is to learn the craft of filmmaking, don’t just go out and read about Tarantino making Reservoir Dogs from watching movies, he’s an anomaly. That’s great for him, but that doesn’t mean that every filmmaker can be Quentin Tarantino. If you’re going to be a filmmaker, learn the craft, learn from people who have already done great things. 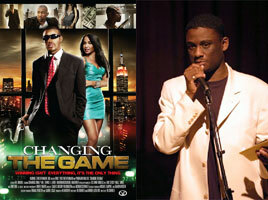 Changing the Game opens at the AMC Loews Cherry Hill on Friday, May 11.